Gideon Falls #11 is out 2/13/2019. By Jarred A. Luján — I’m not going to pretend like I’ve read everything Jeff Lemire has ever written. I’ve read some of his Big 2 work, but only a little of his independent stuff, including his recent Hit-Girl run. Andrea Sorrentino is a similar case, in that before Gideon Falls I’d seen some of his stuff for Marvel and DC, but otherwise, I couldn’t say I devoutly followed his releases. So when Gideon Falls launched, I only picked it up because of a recommendation on Twitter from Marvel writer Matthew Rosenberg. Just shy of a year later, I haven’t missed a single issue of this book. There are few better examples of why than this month’s issue, Gideon Falls #11. So many of Gideon Falls’ horror aspects come from Sorrentino’s willingness to take chances with the way he lays his artwork out. The art in this issue, for example, ranges from traditional panel layouts, to pages with a cyclical panel system, to a page that’s entirely upside down, to make-shift panels scrawled throughout splash pages, to back-to-back-to-back double spread pages. When things really begin to come undone here, Sorrentino’s artwork lets the page come undone as well. Allowing it to feel as disjointed and unnerved as our characters do has consistently set Gideon Falls apart from other horror comics. One of my favorite parts of Gideon Falls has also been the pacing. Lemire has only given us bits and pieces of this intricate plot, and every big influx of information is countered with new ground that makes readers aware of how little they actually know. Lemire is giving the audience pieces to the puzzle, sure, but he’s still withholding how those pieces connect. At 11 issues in, I still have no clue where this story is going, and, just like Sorrentino’s art, that is part of what makes this book so horrifying to me: there is no safety in the prediction of the narrative. As a reader, you are immersed in the protagonists’ stories by knowing only as much as they do. This issue, following what was likely the biggest issue of the run so far, pulled back the curtain on the workings of the Black Barn only to reveal that there are many more curtains. Lemire giveth, Lemire taketh away. 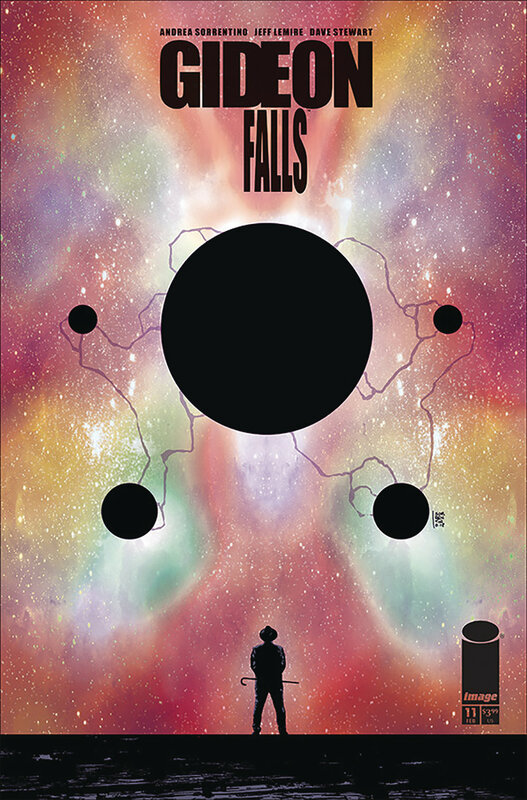 The next chapter of Gideon Falls releases in April, giving us all a month to try and figure out what the hell is going on…but if the past is any indication, I have a feeling we’ll fail at that. Jarred A. Luján makes comics, studies existential philosophy, and listens to hip-hop too loudly. For bad jokes and dog pictures, you can follow him on Twitter.